Stagecoach South Midlands Fleet List: 16524 returned to Oxford from loan to Witney on or around the 27th. News Page: BREAKING NEWS: Stagecoach to come to Reading! New service 72A to Fleet registered by Stagecoach in Hampshire from 23rd December. Weavaway Travel Fleet List: MetroRider TJI 6307 has been sold to Burghfield Mini Coaches along with TJI 6308. Thanks to Derek Bradfield for this. Reading Transport Fleet List: BREAKING NEWS: An order has been placed for a number of high capacity 12-metre double deckers, with the first scheduled to arrive in September 2004. In addition two further Scania / Irizar Century coaches have also been ordered. A67 THX is to become fleet number 67 but Metrobus EYE 344V is only for spares. 919 returned from loan to Newbury during October. Thanks to Brian Coney for all this. 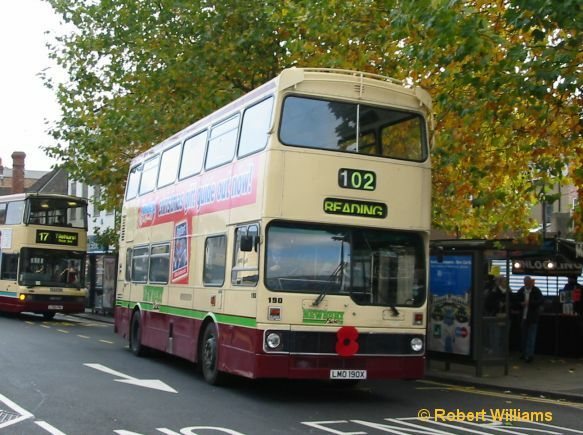 First Berkshire Fleet List: 1551 and 2126 went to First Devon & Cornwall in September. Bluebird 60038 (CX02 EGD) has arrived from First PMT, whilst similar 61135 left for First West Yorkshire in October. Thanks to Brian Coney for this. Reading Transport Fleet List: BREAKING NEWS: New acquisitions are Leyland Titan A67 THX and MCW Metrobus Mk1 EYE 344V received in return for repainting two vehicles from Stagecoach Devon. It is hoped to get the Titan into service as soon as possible, certainly before Christmas. The Metrobus has some kind of modifications and is in a pink livery at the moment so its not yet clear what is happening with this. Thanks to Andy Crump and Mac Head for this. First Berkshire Fleet List: 88 has been withdrawn, passing to First Cymru whilst DML170 replaces it, being a definite transfer from London. 1012 has been allocated to Slough (Chertsey) since September. Stagecoach South Midlands Fleet List: Further corrections to decker seating capacities. Thanks to Keith Wood for this. Meanwhile 14930 has transferred from Rugby to Leamington, 20402 from Leamington to Rugby and 32609-11 from Oxford (reserve) to Wales. 42373 is in new livery. First Berkshire Fleet List: DML170 has arrived at Bracknell from London. It is not yet clear whether this is a transfer or loan. Stagecoach South Midlands Fleet List: 16438 has a new MegaRear for Vauxhall. Thanks to Keith Wood for this. Reading Transport MegaRears: 705 has new MegaRear for Fifa 2004. Thanks to James Cusworth for this. Stagecoach South Midlands Fleet List: 14517 and 40136 are in new livery, with 20557 and 31331 receiving second coats. 40654 has transferred from Rugby to Leamington. Seating capacity information for the exLondon Olympians has been completed. Thanks to Keith Wood for all this. Thames Travel Fleet List: Three new Optare Solos 153/253/353 have arrived, registered KX53 SGY/Z/V. Thanks to Brian Coney for this.